Shown here is one of the vital spots of the Great Wall - the Pa La Ling Gate leading to the famous Nankow Pass. Down this pass swept many a horde of would be invaders of the realm, to be checked and thrown back by the solid barrier they encountered. 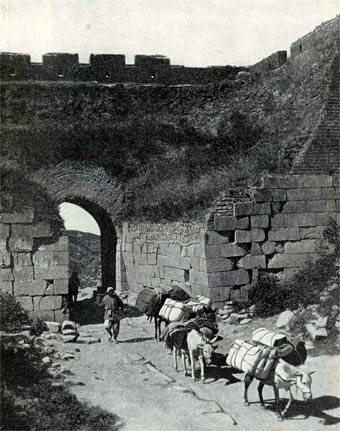 Because the need of a garrison here was recognised long after wall and towers to the far west had ceased to serve any practical purpose and had fallen into dilapidation; this Nankow section was frequently repaired, and the defensive wall was strengthened by a special system of fortifications.